PARIS (Reuters) - A strong majority of people in wealthy countries want to tax the rich more and there is broad support for building up the welfare state in most countries, a survey conducted for the OECD showed on Tuesday. In all of the 21 countries surveyed, more than half of those people polled said they were in favor when asked: "Should the government tax the rich more than they currently do in order to support the poor?" The OECD gave no definition of rich. 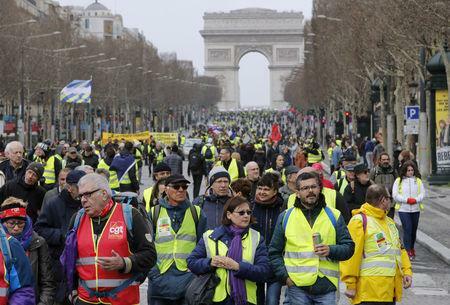 Higher taxation of the rich has emerged as a political lightning rod in many wealthy countries, with U.S Democrats proposing hikes and "yellow vest" protesters in France demanding the wealthy bear a bigger tax burden. Support was highest in Portugal and Greece, both emerging from years of economic crisis, at nearly 80 percent compared with an average of 68 percent, the Organisation for Economic Cooperation and Development said. The Paris-based forum's survey of 22,000 people about perceived social and economic risks also found deep discontent with governments' social welfare polices, which many people said were insufficient, the OECD said. On average, only 20 percent said they could easily receive public benefits if needed while 56 percent thought it would be difficult to get benefits, the survey found. People were on average particularly concerned about access to good quality, affordable long-term care for the elderly, housing and health services. Not only did people say they were not getting their fair share given what they paid into the system, people in all countries except Canada, Denmark, Norway and the Netherlands did not think that their governments were heeding their views. "These feelings spread across most social groups, and are not limited just to those deemed 'left behind'," the OECD said in an analysis of the survey's results. The feeling of injustice was even higher among the highly educated and high-income households, it added. In light of the high level of discontent, a majority of people wanted their government to do more in all countries except France and Denmark, whose welfare systems are among the most generous in the world. Most people said the top priority should be better pensions with 54 percent saying that would make them feel more economically secure. Healthcare followed in second place at 48 percent while nearly 37 percent were in favor of a guaranteed basic income benefit, which has attracted international interest from policymakers but has yet to be tried at the national level.